This is the final part of my conversation with Ethiopian feminist Nebila Abdulmelik in which we talk about the power of words, storytelling and art. Catch up on part 1 (how Nebila became a feminist) and part 2 (why faith plays such a big part in her feminism). Let’s talk about books! You seem just as passionate about books, and words in general, as you are about women’s rights. I’m curious: is there a connection there? To be honest, I’m not sure. I’m a creative and I love stories. You know, we human beings are natural storytellers. Africans even more so because we have that tradition of passing down stories orally from one generation to another. Sometimes when you are an activist or you work in civil society organizations, we can get bogged down in bureaucracy, technical words and academic lingo. Sometimes we forget that there is a vibrancy to people’s lives: people go through terrible things but they do continue to live their lives. They continue to buy groceries, to go to the market, to tell stories. And yet oftentimes, as activists we think that we have to communicate in a theoretical way. Look at how we write reports, for example. So where do we start making a change? I’m happy that we are now getting more creative with how we communicate our messages and how we campaign. There is so much potential in the arts and the creative scene and we can build on that to pass on messages about social change without sounding academic or preachy. People get a lot more from it when you use stories to communicate your messages, be it through music, movies, short stories or poetry. "There is so much potential in the arts to pass on messages about social change without sounding academic or preachy." Look at the way the world reacted to Black Panther. Pretty amazing, right? Exactly. You could never have that kind of impact through a report, a classroom lesson, or anything like that. We have to be smart about the way we communicate and the tools we use to do so. So you’re an avid reader but you’re also a talented poet and a photographer. Balancing your creative life and your career, that’s quite a feat. What does that balance look like? Not so long ago, and for the first time in my life, I quit a full-time position at the African Union to dedicate time and energy to living this creative life. I had put it on the backburner for a long time: I’d work on my art on the side, whenever I had time, but I don’t think I was doing it justice. After I resigned, I joined a storytelling residency with the East Africa Media Lab where I worked on a photography project about discovering Khartoum from a neighbour’s lens. 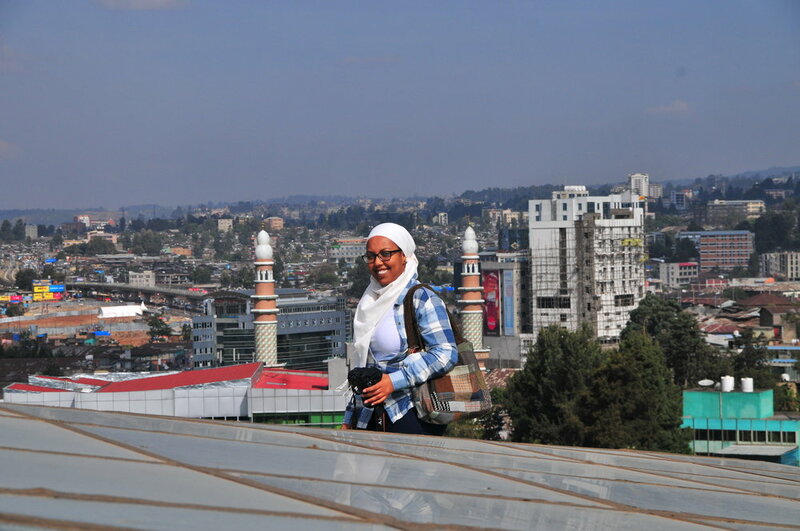 I had already done an exhibition with a friend, called Urbanmorphosis, in which we document Addis Ababa as this urban space that is undergoing a lot of metamorphoses, radical changes really, with neighbourhoods being destroyed and new neighbourhoods being built. For the first time I was able to do a creative project full-time, thanks to the amazing support from the residency. It was really satisfying. Does your photographic work leave you with any time for writing? Definitely. I try to keep my blog, aliben86, active. I post only when something comes to me: following a strict timeline just doesn’t work for me. My big writing project for this year is to publish an anthology of poetry and prose. That’s been in the pipelines for years but I have a lot of new material now, so I want to put together a manuscript and send it to a few publishers or explore self-publishing. I’m also an Editing Fellow with Short Story Day Africa, an organization that publishes a yearly anthology of short stories from African authors. This year, the theme is identity. I’m being mentored in a very practical way: I’m the primary editor for seven stories, and an associate editor for another fourteen stories. Editing a work of fiction is an interesting experience. It’s not about what’s correct and what’s not, it’s about getting to know the authors and their voice. So many exciting projects! Is there a common thread between all of that? I feel like the common thread between all of my creative work is that it’s all about documenting. We won’t be here forever. The people in our lives won’t be here forever. We have to leave behind something, something that reminds people that we were here and this is the way we lived our lives, and these are some of the lessons we learned. "We have to leave behind something, something that reminds people that we were here and this is the way we lived our lives, and these are some of the lessons we learned." Honestly, I want to encourage everybody to write. I guess it doesn't have to be writing, it could be painting or audio recording. It just has to be something that you create and leave behind for the generations to come. We have so many rich experiences, thoughts and perspectives in our minds. I think people need to hear about it. Last question: what is your feminist life motto? Three words: Dignity. Justice. Respect. I hoped you have enjoyed eyala's inaugural interview with Nebila! Catch part 1 about her feminist roots and part 2 about religion. What did you learn? What was your own feminist journey? Tell us in the comments or on Twitter and Facebook @EyalaBlog.